phenomenon that was not visible from Chile where the following images were taken from. Still the show was unique. This Panoramic image was taken above Santiago de Chile one day before the closest conjunction day. The following animated gif is made of 2 images that were taken with a 23h 56 minutes interval and shows the relative motions and positions of the Moon and planets before and after the conjunction. 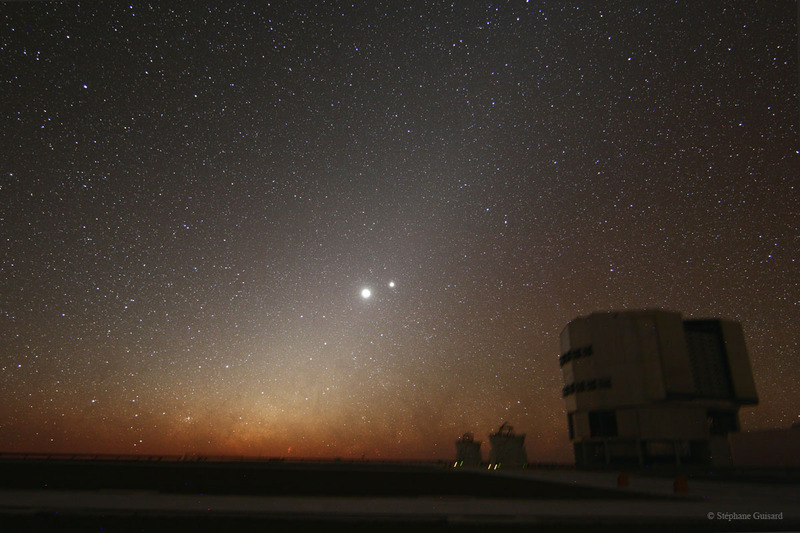 A few days before the conjunction, the Moon was not yet present on this scene taken from Paranal Observatory. 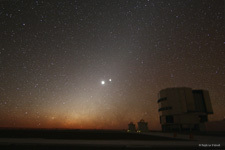 Two auxiliary telescopes (1.8m diameter) and UT1, one of the 8m unit telescopes of the Very Large Telescope (VLT) are visible in front of the zodiacal light, Jupiter and Venus in the early evening, The Milky Way is visible horizontally setting on the horizon.